Here are some examples of what questions you can ask yourself prior to a call (either face to face or telephone) together with some debrief questions to help you move the sales forward. 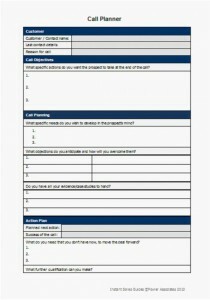 These are also detailed in the Instant Sales Guides tab together with an actual call plan for you to download and use. ☐ What is my call objective(s) – only 1 or 2 SMART objectives? ☐ Who do I need to speak to in this business/division/department? ☐ Who is the key decision maker(s)? ☐ Who is a main influence(s)? ☐ What specific actions do you want the prospect to take at the end of the call? ☐ What potential obstacles exist that will threaten the sale? ☐ What stage am I at in the sales cycle? ☐ How will I open the call? ☐ What information do I have? ☐ What information do I need to find out? ☐ What sort of objections emerge out and how will I handle them? ☐ Did I achieve my objective? ☐ What went right/what went wrong? ☐ What does the customer think about me/my company/our offer? ☐ What information did I gather? ☐ What evidence do I have that this is still a viable sales opportunity? ☐ Did I advance the sale to the next stage? ☐ Who else needs to be involved in the process? ☐ What else do I need to do to progress the sale to the next stage? ☐ When am I next going to see or speak to this customer? ☐ What will be my next call objective? 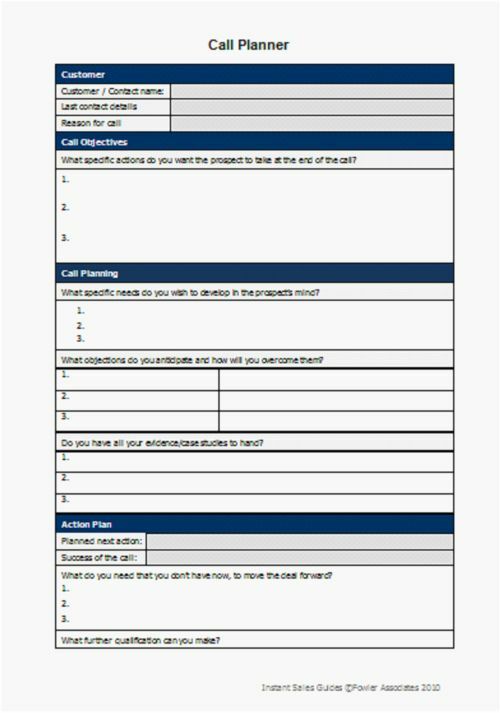 Please comment if you have any feedback – note that you can download a printable pdf version of the checklist together with a call plan and more information regarding call planning from the instant sales guides tab. This entry was written by John, posted on June 7, 2010 at 2:27 pm, filed under Sales Guides, Sales Process and tagged call planning, objective, sales cycle, smart objectives. Bookmark the permalink. Follow any comments here with the RSS feed for this post. Post a comment or leave a trackback: Trackback URL.